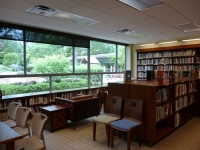 The Am Shalom Library hosts a large collection of Jewish books and periodicals, for all ages and interests. Looking out over the beautiful Perlmutter Courtyard, our library is a great space to study, relax or surf the web via our complimentary guest WiFi. The Am Shalom Library is also home to our Torah Study Minyan, which meets there without fail every Saturday morning at 9:00 am, 52 weeks a year. The discussion is always interesting, and the bagels are always fresh. Please join us! In order to facilitate those wishing to peruse the Library's outstanding selection of Jewish reading and reference materials, the Library's dedicated volunteers maintain an online database of the entire collection. You can access it by using the following link. 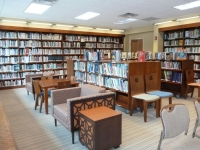 We hope that you will find many occasions to use and enjoy our Am Shalom Library!